Gallstones are small stones that develop in the gallbladder and are the most common cause of emergency hospital admission for people with abdominal pain. About 50,000 people have operations to remove them every year. Although almost one in five people in the UK get gallstones, most do not experience any symptoms from them.They usually consist of cholesterol, bile pigments and calcium salts that form into a hard crystalline mass that can cause a blockage in the bile duct of the gallbladder, which is a small pouch-like organ underneath the liver. They develop because of an imbalance in the chemical make-up of the bile inside the gallbladder and the chances of getting them increase with age. Women are three times more like to get gallstones than men and being overweight is a big risk factor. A diet high in cholesterol, fat, refined carbohydrates, such as white break, cakes and low-fibre cereals contributes to the risk. Symptoms only materialize when the gallstones move and get stuck in a duct in the gallbladder when they will cause severe pain in the upper right hand side of your stomach, just under the ribs. The pain usually occurs about an hour after a meal, especially if it is fatty. Nausea and vomiting, along with feeling sweaty, are a common symptom and you may experience jaundice and a darkening of the urine and pale stools. 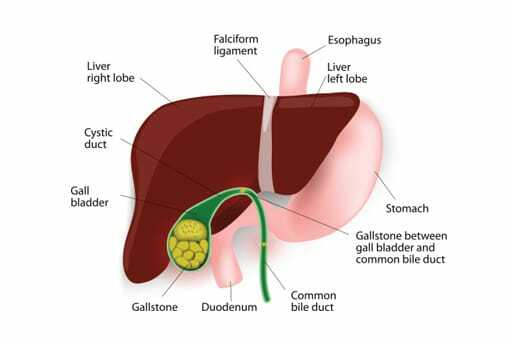 In more serious cases, gallstones can cause a rapid heartbeat, confusion and loss of appetite. Darkening of the urine and pale stools. A simple ultrasound scan is usually enough – sometimes an MRI scan is also necessary. A GP may examine your stomach and also run blood and urine tests to check for inflammation. Further tests including a CT scan and a detailed X-ray can be made to determine the problems in the gallbladder. Symptoms may be managed by a switch to a low-fat diet but if a gallstone becomes stuck and causes significant complications such as jaundice or pancreatitis then an operation is needed. A consultant may advise you to have your gallbladder removed with a cholecystectomy which may be done by laparoscopic – keyhole – or open surgery. Laparoscopic surgery involves small incisions to the stomach to remove the gallbladder with special surgical instruments but surgeons may opt for one larger cut if the gallbladder is very inflamed or the patient is very overweight. Both operations are performed under general anaesthetic and you can usually go home the same day and anticipate recovery in about two weeks. The gallbladder is not an essential organ and people can live normal lives once it has been removed. To ask a question about a gallstones or to book an appointment, contact our specialist team available Monday – Friday 8am – 6pm and on Saturday from 9am – 1pm.